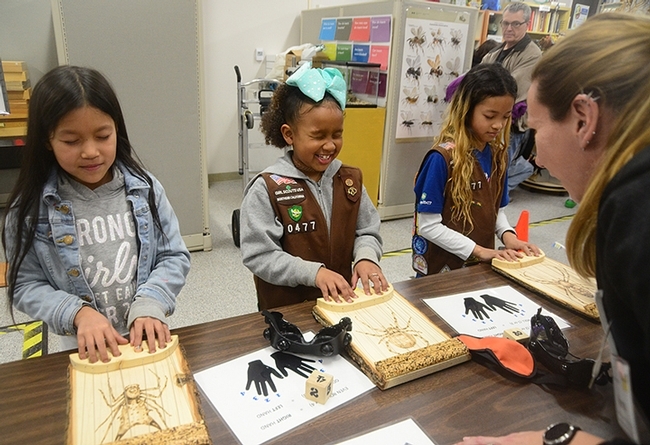 The Bohart Museum of Entomology and the Häagen-Dazs Honey Bee Haven, both part of the UC Davis Department of Entomology and Nematology, will participate in the UC Davis Take Our Daughters and Sons to Work (TODS) Day on Thursday, April 25. The annual event is a national celebration at which employers host their employees' children at their workplace. The Bohart Museum, located in Room 1124 of the Academic Surge Building on Crocker Lane, will greet visitors from 1 to 5 p.m., while the bee haven, located on Bee Biology Road, west of the central campus, will be open from 11 a.m. to 1:30 p.m.
At the Bohart, TODS participants will explore the displays and hold live insects. The Bohart is the home of nearly 8 million insect specimens, plus a gift shop and a live "petting zoo" of Madagascar hissing cockroaches, stick insects (walking sticks) and tarantulas. 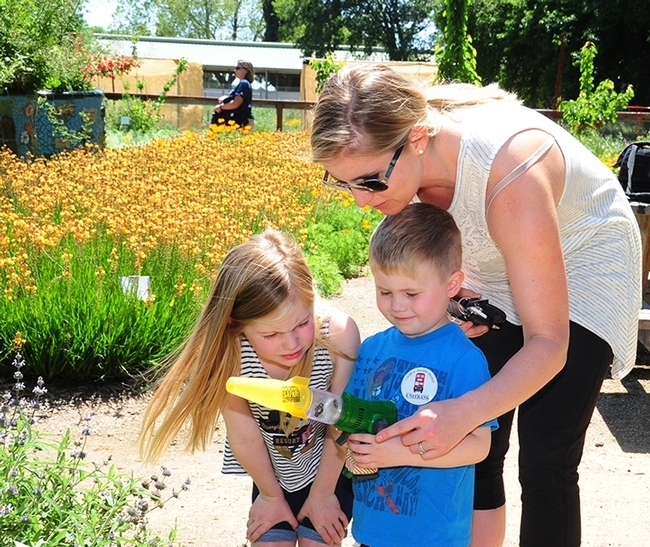 At the haven, a half-acre bee demonstration garden installed in the fall of 2009, docents will guide informal tours. TODS participants can engage in bee watching (bee observation hive), bee identification and a "catch-and-release" bee activity. The UC Davis TODS program is designed for children ages 6-12. "TODS not only exposes girls and boys to what a parent or mentor does during their workday, but shows children the value of their education and provides an opportunity to share how they envision their future and begin steps toward their goals in a hands-on and interactive environment," according to the TODS website. "Kids will have the opportunity to see how our UC Davis community functions, instructs, learns and grows." This event is for staff, faculty, students and their youth guests." More information on what will be open is available on the TODS website. 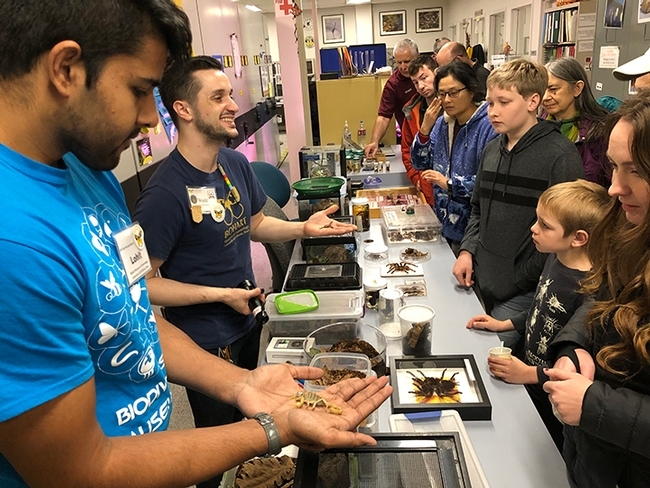 “You're never too far away from a spider; a spider is always watching you," Professor Jason Bond told the crowd at his town-hall presentation at the Bohart Museum of Entomology open house on arachnids. “If you look at the statistics, you have a 60 to 75 percent chance there's a spider in your bathroom and a slightly higher percent chance there are spiders in your bedroom," said Bond, the Evert and Marion Schlinger Endowed Chair in Insect Systematics, UC Davis Department of Entomology and Nematology. "They are always there. There are lots of them on the planet. They're absolutely everywhere." 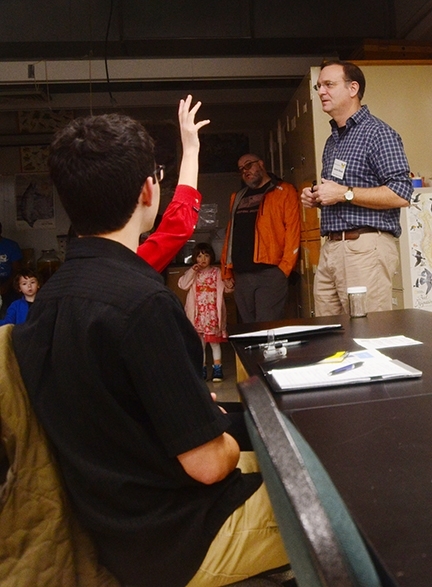 Bond presented a 10-minute, family-friendly talk on spiders, enthralling the crowd. They ranged in age from toddlers to senior citizens. “Spiders are found on every continent on our planet except maybe Antarctica,” Bond related. “But if you go into one of the field stations in Antarctica, you'll probably find a spider there that's been brought in on a ship. Spiders can exist in incredibly harsh environments, including some of the driest places on the planet." It's interesting to compare the numbers, he said. "Compare the 48,000 species to our planet's 9500 species of birds, 5400 species of mammals and 250 species of primates." “And spiders are incredibly old, that is, the lineage has been around a long time," Bond said. "Fossil evidence shows that the common ancestor of the spider goes back to somewhere around 350 million years ago." Among the "superpowers": spiders can fly, leap and carry heavy weights. Through ballooning, "they can travel thousands of feet in air and travel hundreds, if that not thousands of miles, on air currents," Bond said. "They can leap 50 times their body length. They can carry up to 170 times their weight walking across the ceiling." "They really are superpowers," Bond told the crowd. "But what really makes them superpowers are the webs they build, the silk they weave. They use silk for all sorts of things--to line their burrows, build trap doors, make things like sheet webs, and entangle prey." A common misnomer is to call a spider "poisonous." Bond said that "spiders are venomous, not poisonous. Do you know what the difference is? Poisonous is what you eat it make you sick. Venomous means it takes toxin and it injects it into you." Almost all species use venom when they attack and kill their prey. "Of the 48,000 described species, only about 30 or so are known to be harmful to humans," he said. "There are probably more out there, but most spiders aren't harmful." Another misconception involves brown recluse spiders. The brown recluse does not live in California, he said. "It's highly unlikely you've been bitten by a brown recluse here in California. It seems that where brown recluse doesn't occur, is where people always get bitten by brown recluses." Turning to the spider population, Bond estimated that the world spider population weighs 29 million tons. "That's equivalent to 478 Titanics if you were to weigh all these. And the neatest thing about this is they're eating somewhere between 400 to 800 million tons of insect biomass a year. If you took all seven million human adults, and weighed them, that's about 285 million tons. And there's about 70 million tons of children on the planet. So the total weight of humans is about 350 million. If spiders were to consume exclusively humans--they don't consume humans--there would be only enough biomass to sustain spiders for one year." "A spider eats the equivalent of 10 percent of its body weight every day," Bond said. "That's equivalent to a guy like me--I'd like to say I weigh less than 200 pounds or approximately 200 pounds-- eating 20 pounds of meat every day. That's just disgusting, right? You'd never want to eat 20 pounds of meat a day. I'd weigh more if I did that! But spiders are essentially doing that." "Bottom line: Here on planet earth, there are lots of spiders and they're eating lots of things and there's always a spider watching you." 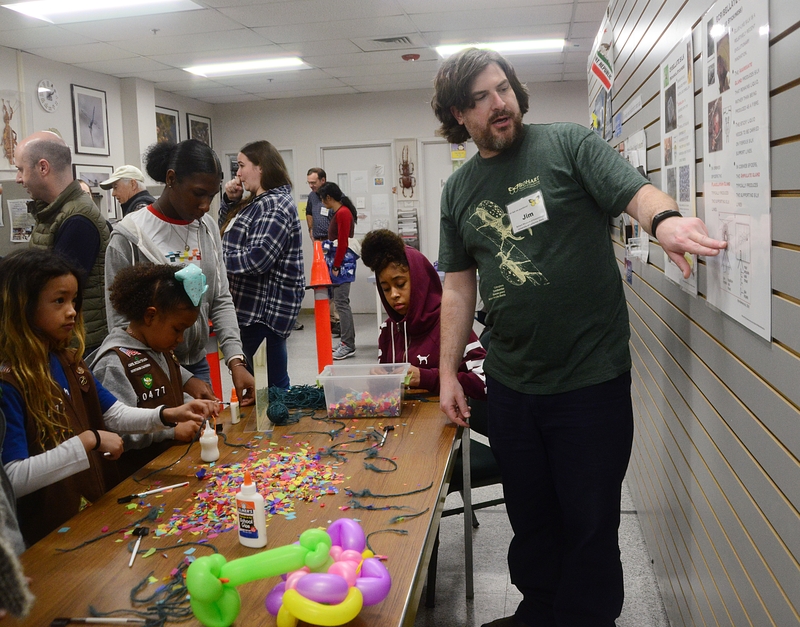 Following his talk, the attendees participated in interactive activities coordinated by scientists in the Bond and Bohart lab. The Bond scientists set up activity stations with themes such as "Spider Senses," "Eat Like a Spider" and "Catch a Moth." 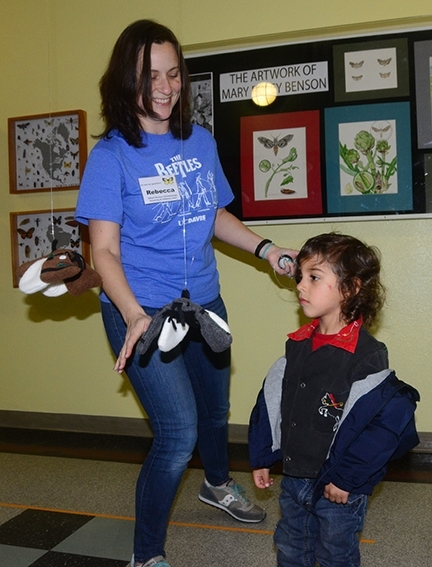 Postdoctoral fellow Vera Opatova of the Bond lab, staffed a table on spider senses; doctoral student Xavier Zahnle encouraged attendees to "eat like a spider" (they sipped applesauce through a straw) and graduate student Rebecca Godwin helped youngsters "Catch a Moth" (using toy stuffed animals, Bolas spiders). 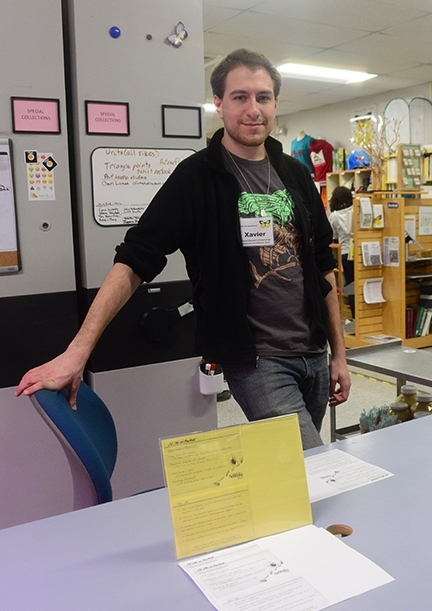 Postdoctoral fellow Jim Starrett explained how sticky spider glue is. Ashley Bui, animal biology major and Lacie Newton, a doctoral student in the Bond lab, staffed the coloring table. 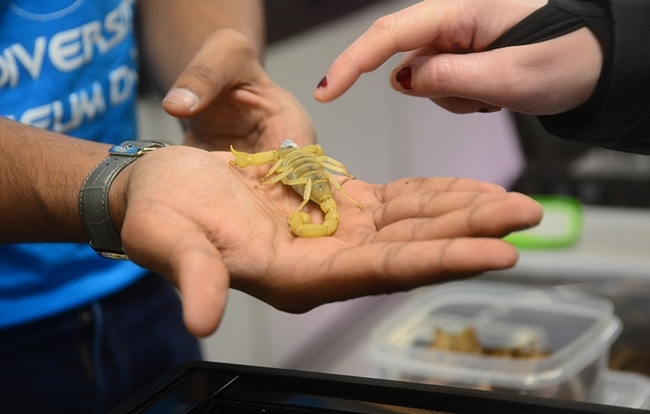 Bohart associates and entomology students Wade Spencer and Lohit Garikipati displayed Spencer's scorpions. 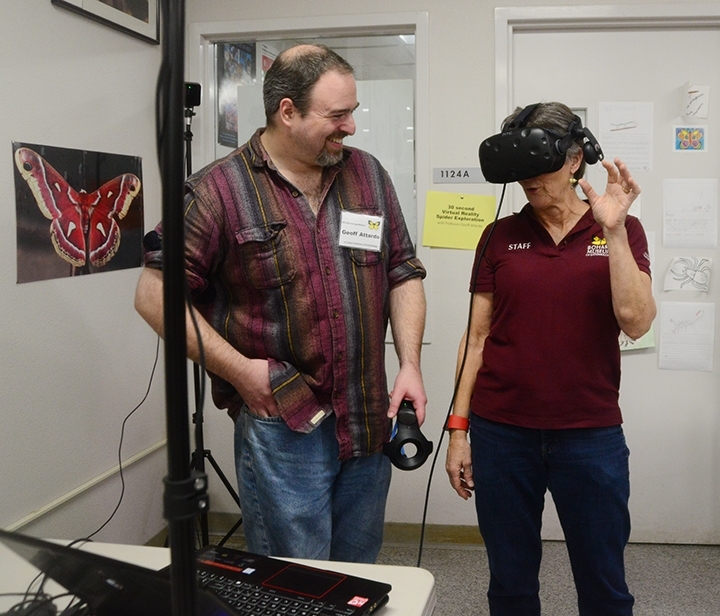 Medical entomologist Geoffrey Attardo, assistant professor, UC Davis Department of Entomology and Nematology, set up a virtual reality station. 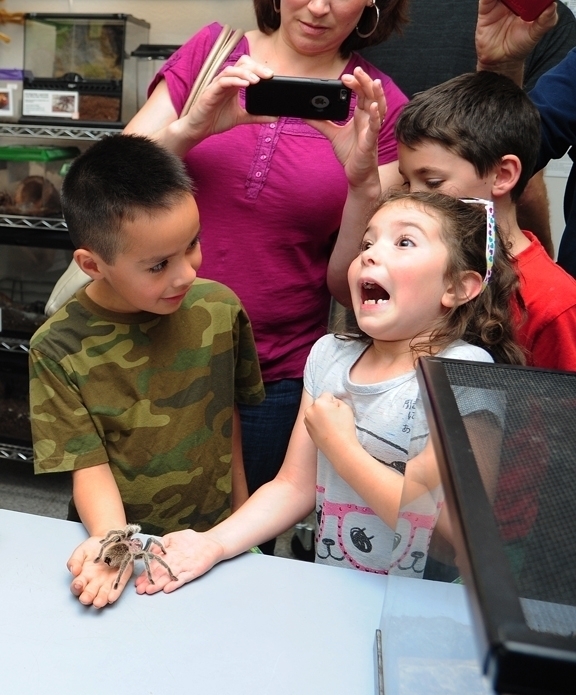 Participants marveled at the 40-foot-tall spiders. Three members of the Brownie Girl Scout Troop 30477 of Vacaville--Kendl Macklin, 7, Jayda Navarette, 8, and Keira Yu, 8--delighted in participating in all the activities. They especially liked the virtual reality station, gleefully holding onto one another for comfort as they viewed the spiders. One Brownie declined to "eat like a spider"--even though fellow participants assured her "It's just applesauce." 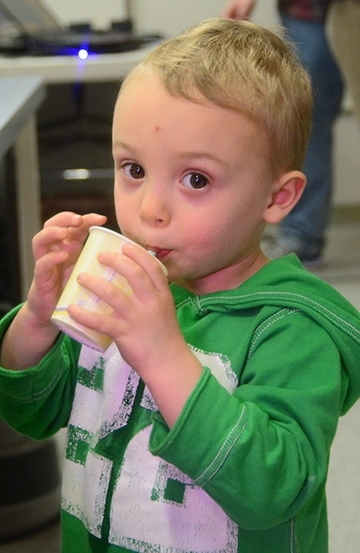 Mikah Jarvis, 2, of Davis loved "eating like a spider." Said his parents: "He loves applesauce." 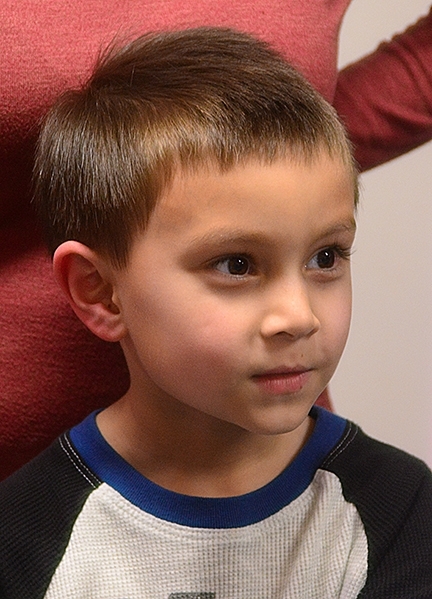 Logan Loss, 6, of Rocklin, who attends John Adams Academy, amazed Spencer with his knowledge of scorpions, gained from watching nature documentaries. The Bohart Museum of Entomology, home of nearly eight million insect specimens, also houses a gift shop and a live "petting zoo," comprised of Madagascar hissing cockroaches, stick insects and tarantulas. The museum, directed by Lynn Kimsey, professor of entomology at UC Davis, is located in Room 1124 of the Academic Surge Building on Crocker Lane. It is open to the public (free admission) on Mondays through Thursdays from 9 a.m. to noon and from 1 to 5 p.m.
DAVIS--EicOsis LLC, a Davis-based company seeking to block chronic pain in humans and companion animals, has received a $5 million investment from Open Philanthropy to move original research developed in the University of California, Davis laboratory of Professor Bruce Hammock into human clinical trials. The drug candidate, known as EC5026, targets a novel pathway to block the underlying cause of certain types of pain. Described by EicOsis as a “novel, non-opioid and oral therapy for neuropathic and inflammatory pain,” it is an inhibitor to the soluble epoxide hydrolase (sEH) enzyme, a key regulatory enzyme involved in the metabolism of fatty acids. UC Davis recently licensed certain patents supporting the underlying technology exclusively to EicOsis. National statistics show that as many as eight out of every 10 American adults suffer from chronic pain; three out of four patients consider their therapies for pain ineffective; and as many as a third of the opioid-prescribed patients misuse them. Every day, more than 130 people in the United States die from opioid overdose, according to the National Institute of Drug Abuse. The Centers for Disease Control and Prevention estimates that the total economic burden of prescription opioid misuse alone in the United States is $78.5 billion a year. That includes the costs of health care, lost productivity, addiction treatment, and criminal justice involvement. The National Institutes of Health (NIH) Blueprint for Neuroscience Research (Blueprint) awarded EicOsis a $4 million grant to advance compounds through Phase 1 clinical trials for diabetic neuropathic pain. A goal of the Blueprint Neurotherapeutics Network is to discover, develop and generate novel compounds that will ultimately be commercialized and benefit humankind. In addition, EicOsis received support from the NIH's National Institute of Neurological Disorders and Stroke (NINDS), and the support of two small business programs affiliated with the National Institute of Environmental Sciences: the Small Business Innovation Research (SBIR) and the Small Business Technology Transfer (STTR). “We are fortunate to receive all this support in the development of our oral medication for pain treatment through human Phase 1a trials, and now Open Philanthropy through human Phase 1b trials and beyond,” said Alan Buckpitt, a UC Davis retired professor of veterinary pharmacology and toxicology, and a principal investigator on the grants. Nationally recognized for his achievements, Hammock is a fellow of the National Academy of Inventors, which honors academic invention and encourages translations of inventions to benefit society. He is a member of the U.S. National Academy of Sciences, a fellow of the Entomological Society of America, and the recipient of scores of awards, including the first McGiff Memorial Awardee in Lipid Biochemistry; and the Bernard B. Brodie Award in Drug Metabolism, sponsored by the America Society for Pharmacology and Experimental Therapeutics. Hammock, a member of the UC Davis faculty since 1980, received his doctorate in entomology and toxicology from UC Berkeley. 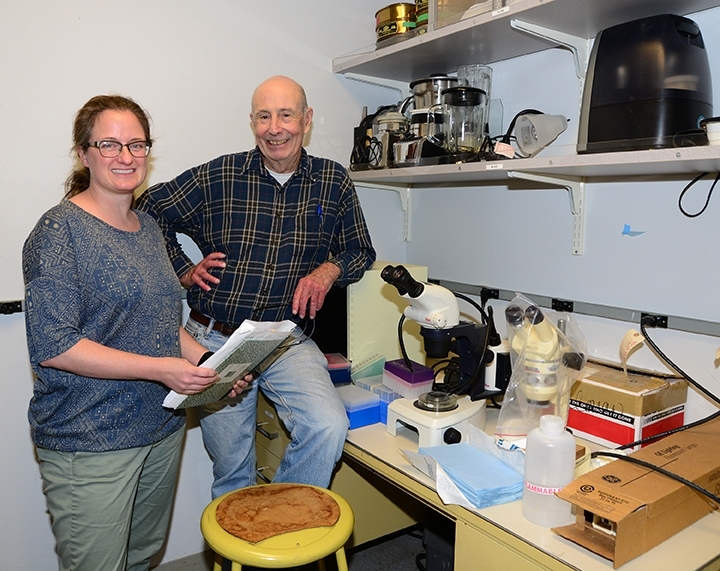 He traces the history of his enzyme research to 1969 during his graduate student days in the John Casida laboratory. Hammock was researching insect developmental biology and green insecticides when he and colleague Sarjeet Gill, now a distinguished professor at UC Riverside, discovered the target enzyme in mammals that regulates epoxy fatty acids. “Basically, I began by trying to figure out how a key enzyme, epoxide hydrolase, degrades a caterpillar's juvenile hormone, leading to metamorphosis from the larval stage to the adult insect,” Hammock. He asked himself these questions: “Does the enzyme occur in plants? Does it occur in mammals?" It does, and particularly as a soluble epoxide hydrolase in mammals. Postdoctoral researcher and spider silk expert Sarah Stellwagen, University of Maryland Baltimore County (UMBC), will speak on "Towards Spider Glue: From Material Properties to Sequencing the Longest Silk Family Gene" at the UC Davis Department of Entomology and Nematology seminar at 4:10 p.m., Wednesday, April 24 in Room 122 of Briggs Hall. 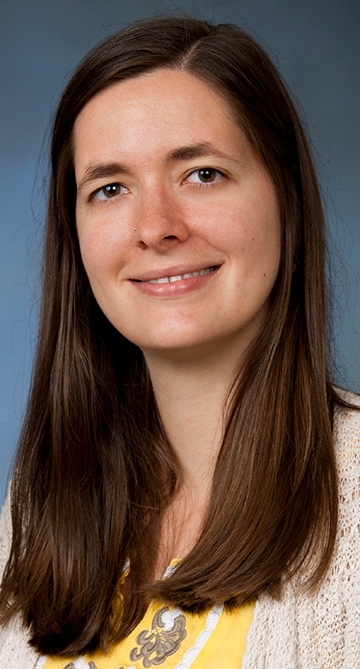 She and colleague Rebecca Rensberg sequenced the genes that encode for the spider glue protein. Their work appears in the April edition of the journal G3-Genes Genomes Genetics. Stellwagen said she is particularly interested in the "biomechanical properties and genetics of silk, particularly the aggregate glue that orb-weaving spiders deposit on the capture spiral silk of their webs." 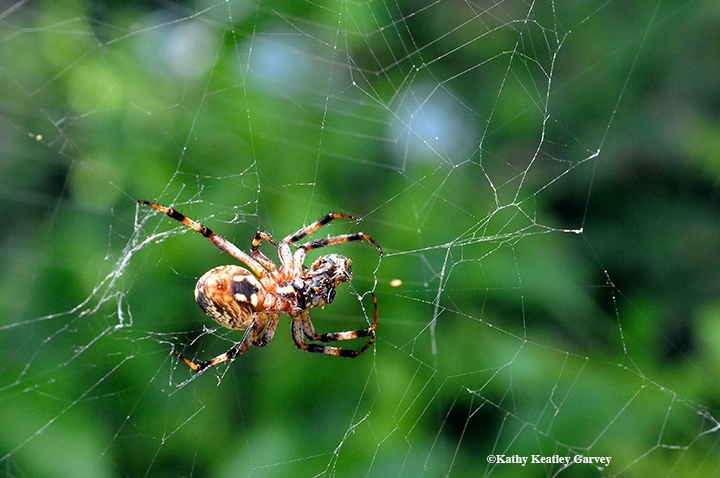 "I'll be talking about the biomechanics of spider glue--how droplets of glue on a spiders web stretch, and how environmental variables like humidity, temperature, and ultraviolet light affect that stretch," Stellwagen said. "I'll also be talking about the molecular biology of the glue--discovering the DNA sequences that code for main proteins that make up the glue, and how that sequence relates to the mechanical properties." Stellwagen said that "most people are unaware of the glue on a spider's web because you can't see the droplets with your naked eye, but it's a really important feature of the web that spiders rely on to capture prey. Spider glue is also a modified silk protein, but has lost its fibrous characteristics that we think of when we hear the word silk. Currently, there are only around 20 full-length silk genes known--but many, many partial sequences--because these genes are really hard to sequence due to their size and repetitiveness. I'll talk about why it's so difficult to sequence silk genes, and what got my research over the hurdles." An individual orb weaving spider can spin up to seven different types of silk, cach with unique functions and material properties, Stellwagen explained. "The capture spiral silk of classic two-dimensional aéenal orb webs is coated with amorphous glue droplets that function to retain prey that get caught in a web. The glue differs from solid silk fibers as it is a viscoelastic, amorphic, wet material that is responsive to environmental conditions. Humidity causes changes in the glue's maternal properties, like stretchiness and adhesion, while temperature mediates these affects. The glue is more or less resistant to damage caused by ultraviolet radiation depending on a species' habitat." "At the molecular level, spider glue is a modified silk that is mostly comprised of proteins called spidroins (spider fibroins) encoded by two members of the silk gene family." 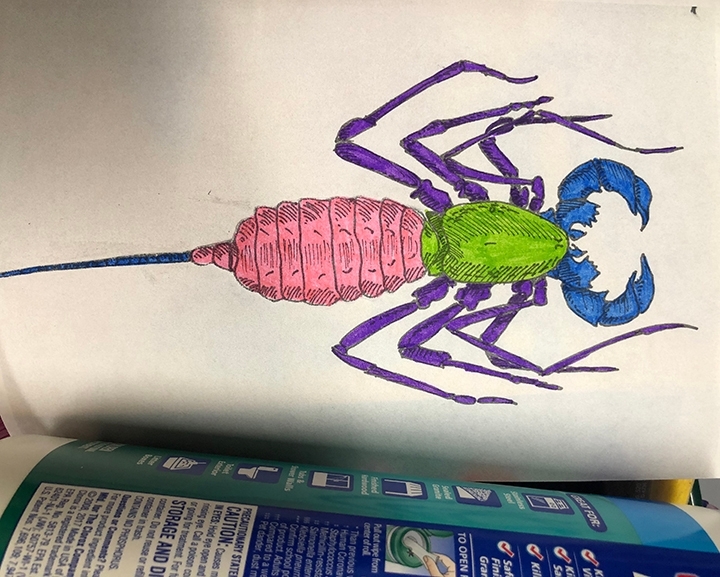 Stellwagen, whose postdoctoral research focuses on arachnids, is currently working with Mercedes Burns studying population genetics of Japanese facultative parthenogenic harvestmen. Using Oxford Nanopore, she is sequencing the genome of the polyploid species Leiobunum manubriatum in an effort to understand their mixed ploidy and sexual/asexual reproductive modes. Stellwagen received her doctorate in biological sciences in July of 2015 from Virginia Polytechnic Institute and State University, Blacksburg, Va. Her dissertation: "Structure and Function of the Viscous Capture Spiral and its Relationship to the Architecture of Spider Orb Webs." She holds two degrees from Clemson University, South Carolina: a bachelor's degree and a master's degree. Her master's thesis: "Spider (Aranea) Diversity, Habitat Distributions and Pitfall Trapping in Kings Mountain National Military Park, South Carolina." Stellwagen has also published her work on spider glue in the Journal of Experimental Biology and the Journal of Arachnology. 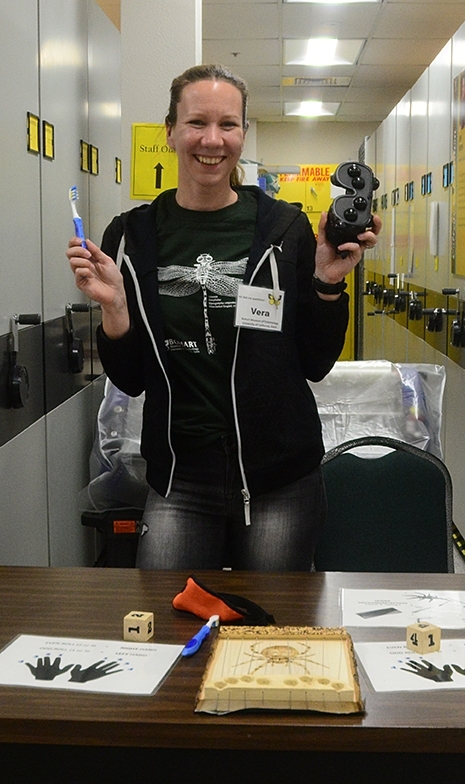 She delivered oral presentations on "Towards Spider Glue: Sequencing the Longest Known Silk Family Gene" at the 2019 International Congress of of Arachnology, Christchurch, New Zealand, and the 2018 American Arachnological Society Annual Meeting in Ypsilanti, Mich.
Seminar hosts are Hanna Kahl, UC Davis doctoral student in entomology, and Jason Bond, the Evert and Marion Schlinger Endowed Chair in Insect Systematics, UC Davis Department of Entomology and Nematology. 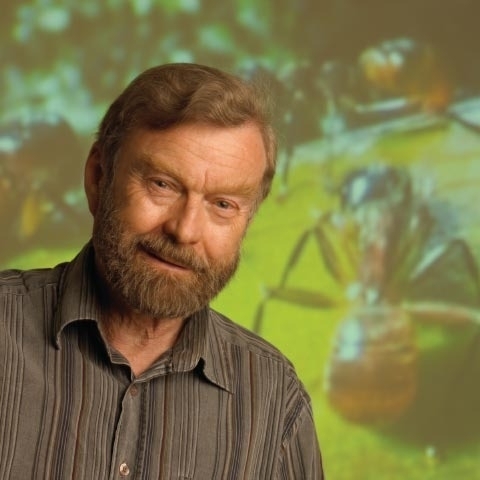 Pulitzer-Prize winner Bert Hölldobler, one of the world's leading ant experts, will speak on "The Superorganism: Communication, Cooperation and Conflict in Ant Societies" at the UC Davis Department of Entomology and Nematology's seminar on Wednesday, April 17 at 4:10 p.m. in Room 122 of Briggs Hall. Hölldobler, an evolutionary biologist based at Arizona State University researches the evolution and social organization in ants. He says that colonies that are "true superorganisms, show great cooperation among their nest mates and exhibit fierce aggression against neighboring conspecific colonies and display complex territorial strategies." His experimental and theoretical contributions cover sociobiology, behavioral ecology, and chemical ecology. Hölldobler and co-author E. O. Wilson won the Pulitzer Prize for non-fiction writing in 1990 for their book, The Ants. They also co-authored The Superorganism: The Beauty, Elegance, and Strangeness of Insect Societies and Journey to the Ants: A Journey of Scientific Exploration. Hölldobler is also the author of The Leafcutter Ants. A native of Bavaria, Germany (born June 25, 1936), he studied biology and chemistry at the University of Würzburg. He wrote his doctoral thesis on the social behavior of the male carpenter ant and their role in the organization of carpenter ant societies. Hölldobler began his academic career at the University of Frankfurt in 1971 as a professor of zoology. From 1973 to 1990 he served as professor of biology and the Alexander Agassiz professor of zoology at Harvard University, Cambridge, Mass. Hölldobler returned to Germany in 1989 to accept the chair of behavioral physiology and sociobiology at the Theodor-Boveri-Institute of the University of Würzburg. From 2002 to 2008, Hölldobler was an Andrew D. White Professor-at-Large at Cornell University, Ithaca, N.Y. 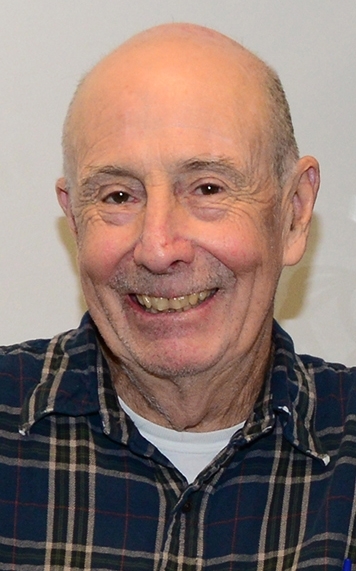 Since his retirement in 2004, he has worked at Arizona State University (ASU) as a professor and research scientist. A Regents' and Foundation professor, he is one of the founders of the Social Insect Research Group (SIRG) and of the Center for Social Dynamics and Complexity.